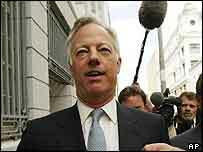 Sir Mark Thatcher, the son of former UK prime minister Baroness Thatcher, and his wife Diane are to divorce. The 18-year marriage is to end because of an "irretrievable breakdown", the couple said in a joint statement. They cited a "difficult year" during which Sir Mark was arrested in South Africa, accused of being involved in an alleged coup plot in Equatorial Guinea. They said they would still "participate jointly" in the upbringing of their children - Michael, 16, and Amanda, 12. Sir Mark will live in Europe while his ex-wife and children will be based in the US. Baroness Thatcher said: "I am saddened by this news but it is a private matter so I shall make no further comment." The couple, who met in the US, moved with their children to South Africa in 1995, but their life was turned upside down last year when Sir Mark was arrested and detained. In January this year, Sir Mark, 52, pleaded guilty to unwittingly funding the purchase of an aircraft which was allegedly to be used by the mercenaries, but he denied any involvement in the alleged coup attempt. He was fined the equivalent of US$500,000 (£265,000) and given a four-year suspended jail term. His wife returned to the US with the couple's children. Sir Mark planned to join them, but his visa renewal application was rejected in April. 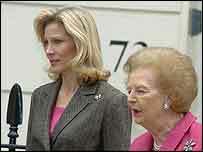 Sir Mark is the only son of Lady Thatcher and her late husband Denis. Educated at Harrow, he left in 1971 with just three O-levels. He did not go to university, and failed his accountancy exams three times. He was once described by the Financial Times newspaper as "a sort of Harrovian Arthur Daley with a famous mum". Before the South African trial, he was probably best known for getting lost in the Saharan desert during an ill-advised attempt at the Paris-Dakar rally in 1982. He married Diane Burgdorf, the daughter of a millionaire Texas car dealer, in 1987 after meeting at a party in Dallas while Sir Mark was working as a representative for Lotus cars.